Save up to 30% on medium to high run commercial printing (including Four Color Printing) using international printers in Hong Kong or other overseas markets. Hong Kong Printing Saves You Money! Printers in Hong Kong, China, Asia, Indonesia, etc. can print for significantly less. 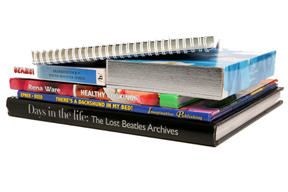 Printing projects can be as diverse as soft and hard cover books, children's books, Textbooks, cookbooks,journals, catalogs, magazines, brochures, coffee table books, packaging, labels and more! "Get a Quote from Printers in Hong Kong"
Get the same high quality printing for a lot less when you use Hong Kong printers, printers in China or Asian printing companies. Production costs on Hong Kong printing can be significantly lower than having it printed locally and most printers in Hong Kong work rotating shifts 24/7 providing fast, high quality production and extremely reliable service but for a lot less. Normal production time for commercial printers in Hong Kong is one week for pre-press and the printing of press proofs, and one to two weeks for printing and post-press, depending on the quantity and complexity of the job. You will receive actual press proofs (try to get these in your local market!) and bound book samples allowing you see your end product at the proof stage. Save money without sacrificing quality on your next print project by using printers in Hong Kong, China, Asia, India, Indonesia, Taiwan, Korea or Singapore. d delivery to your door. Artful Dragon Press makes printing in Hong Kong easy and profitable for you. For more information about using Hong Kong printers email Artful Dragon Press at tpage@artfuldragon.com .